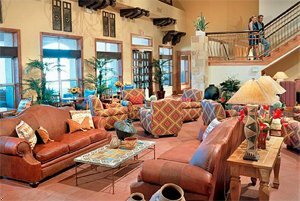 Set amidst the magnificent backdrop of the Sonoran Desert, the finely detailed, fully furnished vacation villas of the Sheraton Desert Oasis were designed in a setting of unparalleled splendor. Nestled near the renowned Scottsdale Tournament Players Club, host of the PGA's Phoenix Open, the luxurious villas boast a 4,500 square foot swimming pool, spray pool, cascading waterfalls, secluded spa grotto, poolside cabana, children's play area, fitness center with arcade and snack bar, a centrally located clubhouse which includes a spacious owner's lounge, juice bar, gift shop and more. For centuries the Sonoran Desert has conjured up visions of exotic flora and fauna, sacred mountains, boundless spaces, and an almost mystical tranquility. A peacefulness of spirit. A seductive spell. At Sheraton Desert Oasis, these romantic reveries are vividly real. The Resort is located in the heart of North Scottsdale, .02 miles from Tournament Player's Club - home of the Phoenix Open. Sheraton Desert Oasis is 21 miles from Phoenix Sky Harbor Airport and convenient to numerous golf courses, fresh water lakes, desert wilderness, urban attractions and major sporting events. Special Conditions The Sheraton Desert Oasis does not offer non-smoking rooms. This property has limited participation with the Starwood Preferred Guest program. For further details please see the Starwood Preferred Guest Terms and Conditions. From January 6, 2006 to January 11, 2006, the large pool will not be available due to annual cleaning. During this time, the small pool will remain open. Please contact the resort for further information. Take Interstate 17 South to 101 East and take Exit 35 (Hayden Road). Turn right onto Hayden Road, and the Sheraton Desert Oasis will be the first property on the right. Take Interstate 10 East to 101 North and take Exit 35 (Hayden Road). Turn right at light on Hayden Road, and the Sheraton Desert Oasis will be the first property on the right. Take Interstate 10 West to 202 East and then to 101 North. Take Exit 35 (Hayden Road) and turn right onto Hayden Road. The Sheraton Desert Oasis will be the first property on the right. Take I-10 East to 101 North and take Exit 35 (Hayden Road). Turn right onto Hayden Road at the light, and the Sheraton Desert Oasis will be the first property on the right.